I want to write today about a conundrum that faces our national team program year in year out. And not just here in the US… also in Canada and Australia. I’m also going to assume in Russia. You might guess, given the size of these nations, that it has something to do with the huge geography of these countries. And this issue concerns all racing classes. It’s the issue of building a team, a team of the best athletes without the benefit of having the team gel before the actual competition. So, what does that mean “gel”. You hear it all the time… the team came together, gelled, just in time to win the championship game, right? The urban definition goes something like… A positive word used when people get on well with each other and therefore connect. Connect… so they become a tribe, a community, a movement, a crew! So, when someone says we connected, we gelled as a team. What it really means is that they collectively trust each other. They trust that each and every person on that team will do anything and everything it takes to achieve the goal of the team whether it’s to bring meat back to the village or to win the world championships… the gold. All relationships, and especially human relationships, successful human relationships, are based on trust. Not based on equality… in fact… There’s usually a hierarchy within these groups. There kinda has to be, that’s a whole other topic… but all dynamics within those relationships rely on trust to ensure the success of the group. I thought of a good and obvious example of how the inability to gel and lack of trust can take a collective of superior athletes, a goal, with the end result being epic failure. In the last 3 Olympic Games, and at many world track & field championships, despite being the country with the absolute deepest collection of sprint talent, the men’s 4x100m sprint relay team has not won a medal. Not gold, not silver, not bronze. In fact, they didn’t place at all… disqualified! A baton fumble, doping, exchange zone infraction… it really doesn’t matter what happened on the day. I would argue that the failure was a result of the complete absence of the conditions needed for the team to gel… to trust each other. Incredibly inflated egos, trash talking each other, agents and sponsors arguing about who should be on the team, in what order they should race and an unwillingness to train together in any meaningful way prior to the Olympic Games. Epic fail. I sometimes listen to a fellow on YouTube by the name of Simon Sinek who speaks to companies about their team dynamics, leadership, those sorts of things… He likes to talk about marines… uses them as a metaphor or analogy, so I’m going to give that a try here. The dynamic of a prospective dragon boat team, a national team, is kinda like a group of marine recruits at boot camp… why are they there? Sure, they want to get stronger, learn new skills, desire to serve a higher purpose… Maybe their tolerance for pain goes up a notch but really what they are there to gain most of all, or at least the goal of their leaders, is to have them understand and achieve TRUST. Trust in their sisters and brothers that she or he has your back no matter what. And I mean, like, take a bullet trust, right? #2. Experiences… meaning there needs to be a number of experiences with other individuals on your team, either one-on-one or as a group. You need to see examples of things that they do that show you that you can rely on them… that’s trust building. You don’t go on a date and boom, get married! At least I hope not. It takes time. A conversation in a bar, a text, a phone call, a movie, dinner, a dinner and nite cap at her place, right? Experiences. Meet the parents… that’s a biggie. Can she trust you in front of her family? Wow. OK, so now you trust each other, get married… kids, wow. You’d better be able to trust each other. Right? What we’ve got now is the equivalent of an arranged, shotgun wedding. First date, grab your paddle, go all-in with everything at stake! Your ultimate goal, that absolute pinnacle of the sport and you’re shakin’ hands with your seat mate, nice to meet you, let’s gel. It doesn’t work that way. I recently spent the holidays up in Toronto and had an opportunity to have lunch with the new Dragon Boat Canada president Scott Murray. When I told him about this presentation he told me that the Canadian crews, Team Canada, had already solved the problem. And I thought, this is so great. I can finish up my blog by handing you all the solution. Scott told me that, in Canada, what they do is allow the crew coaches to keep their core group of athletes, good paddlers from their club crew, maybe up to about 16 or so who know each other well and who have trained and raced together repeatedly for months, even years… and then they select key athletes who are known (by reputation) in the paddling community, in other parts of the country, to prop up the team as necessary. As I listened, at first it seemed to make sense, I had my answer… but then I realized that he was describing the problem, not the answer. If ¼ of the crew was essentially unknown to the core 16 paddlers, then this crew would not likely have gelled sufficiently by the time Worlds comes around to race absolutely-perfectly as a team. Let’s assume they have a collection of the most talented athletes in the country but without a connection, without absolute trust, the perfect race… it’s gonna remain elusive. So, what’s the answer. And I apologize to you now because I am not going to blow your minds or anything so dramatic. It’s technology… specifically digital communication technology, social interactive technology. 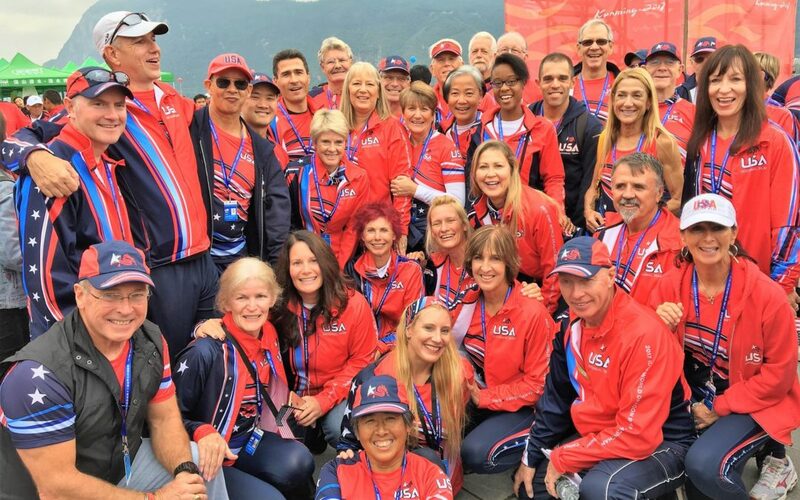 Can we use technology to build relationships… build trust… a bond… a meaningful relationship with someone who we will not physically meet until possibly a training day just prior to world championships? How do we use the power of technology to build trust between strangers? How do we mimic the pathways to trust… the way trust is built… how can the entire team gel, online? Here’s a popular social, interactive communication technology, Skype. There are others… Google Hangouts, VSee, GoToMeeting, ZOOM… plenty more. I use Skype every day to build and maintain that “look ‘em in the eye” trust in business and in my personal life. Tomorrow I have a skype call with my paddle maker in China. Tonight, I’ll take a video call from my sweetheart of a girlfriend who lives 1300 miles away up in Toronto. I can tell you without a doubt that this technology builds relationships… and trust within those relationships. Coincidently Skype group calls max out at 25… about the size of a what? A dragon boat team! So, what I am suggesting to coaches and team leaders, is a massive effort should be made to initially and consistently connect everyone who is in contention for a seat in the boat going to Thailand in 2019 using some form of social, interactive communication technology. It should be a required element of each and every national team program in the country. I’m not just talking about a coach interacting with the athletes. I’m suggesting that this team building policy is mandated… that athletes, prospective team-mates, in groups of three or more, should regularly connect by live video in order to build relationships between themselves. They should share their weekly challenges and successes in training and in competition. Initially it would need to be structured and formatted to ensure that everyone becomes engaged… everybody buys in. I would bet that relationships and trust would begin to evolve organically after only a few of these arranged interactions. After all, we are social animals, right? When you finally meet as a team, all in one place, it won’t be a handshake… it will be a hug. It won’t be, who is this stranger who took my friend’s seat… it will be your friend, your new long-distance friend who you know intimately and trust completely. Because ultimately trust will gain you that ½ second… and that half-second could be what makes you all world champions.